When an old man made something like this he’d hand it to his young son. “Here’s your charm, your good luck that I give you.” Some of these items gave men good luck in their hunting. They meant a lot - they were powerful. This walrus ivory handle and strap were used for hauling seals across the ocean ice back to the village. The hunter cut a slit through the animal’s lip or beneath its jaw then pushed the loop through the slit and back over the handle. He attached a longer line that either he or his dogs could pull. 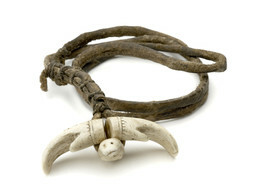 The ivory handle is also a hunting charm, carved to represent two mittens joined end-to-end with a seal’s head in the center. Ron Brower, Sr.: Natchiqsiuqtuni taamna putullakługu uvuuna nuvivxugu tavruŋa sigguŋagun natchiq talirrutaa tavruŋaqługu qaisuurut. Ron Brower, Sr.: You put a hole up in here [through jaw], tie the seal, pull that strap and tie it to your drag. Seal drag. Kenneth Toovak: When the old man makes something like this, then he’d hand it to his young son. “Here’s your charms, your good wish luck, that I gave you.” Some of these items—and the one we’re talking of—give men good luck in their hunting. They mean a lot. They were powerful. Fancy work there [carved ivory toggle]. Ron Brower, Sr.: The thumbs [of toggle] sometimes resemble the polar bear, because seals eat the polar bear. 1. According to Iñupiaq Elder Martha Aiken, an uqsi [connector] is “a hook or a piece made from bone or antler or a loop at the end of a rope that acts as a connector.” It is a type of object referred to as a line attacher, cord attacher or toggle. An uqsiutaq [seal drag] is a “piece made from bone or antler at the end of a rope. Lt. P. H. Ray—in the Barrow area from 1881 to1883—noted that “each hunter must be supplied with at least one of these drags, as it is not considered proper to fasten to a seal with a line that is used for any other purpose; when they get near shore the drag is removed and a few drops of fresh water is poured into the mouth of each seal before it is taken from the ice to the land. . . The drag handle pictured here—collected by Ray from Point Barrow in 1883— is carved in three separate pieces, two mittens joined end-to-end and a small seal head. “The mittens are ornamented on the back with a blackened incised pattern, and the seal has blue glass beads for eyes and blackened incised spots on the back.” There is a hole in each piece through which the drag line passes. The loop is secured below the handle with sinew.